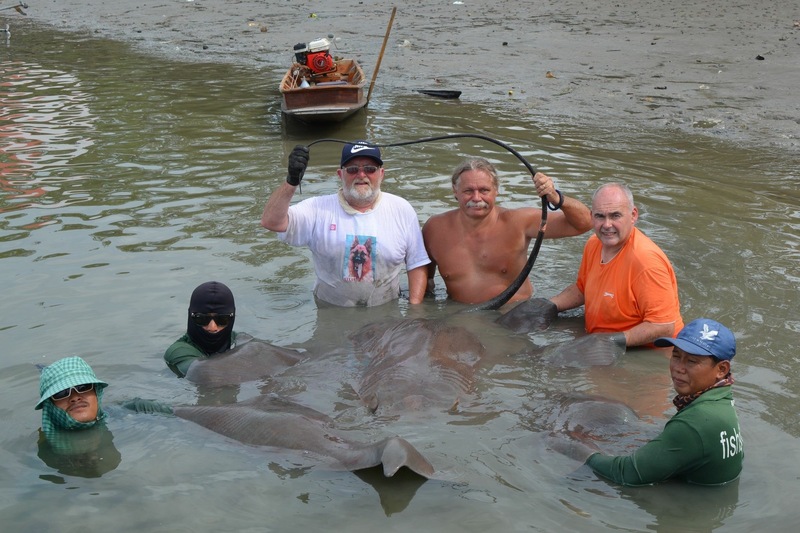 A short day trip fishing for Giant freshwater stingrays at the Mae klong River saw Palm Tree owner Tim Webb accompanied by UK anglers Micky and Eddie making an early start. After deploying baits at various points in a very wide section of the tidal river the anglers waited for events to unfold. A few hours of inactivity followed as the tidal river slowly began to rise. With the tidal river at optimum level one of the baits was soon picked up. The unseen stingray powered off downstream on a determined run causing the boat to be towed behind it. With the rod bent fully into the Giant freshwater stingray the anglers held on until the fish came to a halt allowing them to regain line onto the multiplier reel. An epic battle followed which saw Micky and Eddie both taking turns in an effort to bring the stingray off the bottom. It would be almost two hours before the Giant freshwater stingray was finally netted a considerable distance from where it was first hooked. After carefully transporting the fish to the riverside it was observed to be a big female with a width of 1.73m and was estimated to weigh between 170-180 kg’s. The stingray was allowed a short time for recovery and photography before being released. The angler fished for a further few hours but did not land any more stingrays.